Nice city, nice flowers and gardens, great teachers – and four seasons in one day. Although Veronika Shirobokva (pictured here with Scottie, the School mascot) has travelled extensively in Europe and also visited the UAE, this is the first time she’s ever been to Scotland and the UK. Veronika has recently come to Global School for two weeks after winning a British Council competition in her native Russia. She likes Edinburgh, but finds the Scottish weather very different from what she’s used to in Russia. Veronika lives in Izhersk, about 1,000 miles east of Moscow, so she’s used to much colder weather than we get here. At home she says that you just put a coat on and keep it on all day, but here the weather changes during the day, so you can start with a coat and then have to take it off as the weather warms up, then put it on again if it starts to rain. At this point, I told her about the English expression, “four seasons in one day”. She laughed and wrote it down so she could remember it! Veronika is a vegan, so we discussed how easy it is to get vegan food in Scotland. She said she brought some of her own supplies, “just in case”, but in fact she can get almost everything that she wants here. That’s good news if you are a vegan or vegetarian or eat only halal or kosher. We cater for all tastes here! She had only been in Edinburgh for a few days when we met, but she has had the chance to walk around and look at the parks and gardens in the city. Veronika particularly likes nature and said she really liked strolling about in Princes Street Gardens, looking at the flowers. Over the next few days she hopes to see the Castle and some of the other buildings, but she did admit she’s more interested in the natural world rather than history so she would probably spend more time in the gardens than in museums. However, she has also found some very good second hand bookshops and bought some interesting books. She really likes the School, telling me, “I love my teacher, she’s very nice and we’ve connected well. Also, the fact that there are only a few students in the advanced class means that we get lots of time to talk and discuss a whole range of different issues”. One of the key attractions of coming to Edinburgh was the chance to stay with host families. Giovanna Malchiodi comes from Piacenza, near Milan in northern Italy. She is the leader of a group of 50, mainly 15 and 16 year old, Italian students currently studying at our School in Edinburgh. None of these students had ever been to Scotland, so I began our conversation by asking what they knew about our country before they travelled and then what their first impressions have been. “We didn’t teach them a lot about Scotland before we came here. That’s because we prefer them to discover things when they arrive. For the more senior pupils, we did suggest they did a little research about the important museums and castles, but in general they came here without a lot of prior knowledge. However, like most people, they had the stereotypical view of Scots in kilts playing bagpipes – a bit like the School mascot!” (Giovanna is pictured with Scottie, our mascot, in the photo above). “So far, the best things have been Edinburgh Castle and the Old Town in general. It’s very picturesque and interesting. They also love the shops! “One of the key attractions of coming here was the chance to stay with host families. We were keen that our students didn’t stay in college accommodation as that would mean they would just speak to each other in Italian. The host families are so welcoming and very good at looking after the students. We rely on them to look after our young people and I’m very happy with the standards they set and the generous way they help the boys and girls get to know their country. “As far as the School’s concerned, what’s pleasing to me is the way they are so open to changing the programme for us and coming up with new ideas and plans. The teachers are brilliant and I’d say this is a very high level school compared to most others. The visits, tours and morning classes are good – in fact the whole package is excellent. Do you think the Loch Ness Monster actually exists? In our last two blogs we provided some weblinks that suggest she might, but there are, of course, others who think that she is just a myth, kept going to help the tourist industry in northern Scotland. 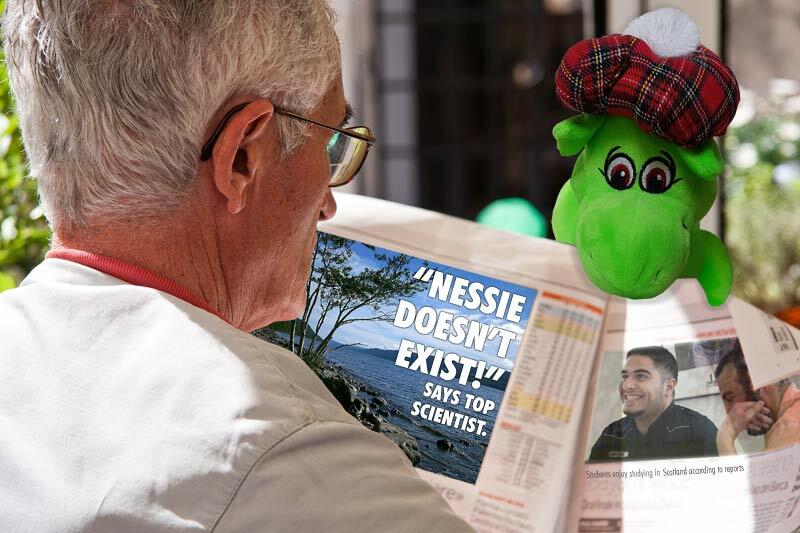 Certainly, one of the most powerful arguments against Nessie existing is that we should found her by now. Although there are lots of people who have seen something, there is not any definitive sighting or photograph that conclusively proves she exists. However, it’s well known that humans have not discovered every creature that exists and that many of those still to be discovered live in the depth of the oceans. Loch Ness, while very deep, is hardly an ocean though. However, we have news for all the scientists. Nessie is alive and well and has just joined Scottie and Bonnie, our other mascots, to add to the School’s marketing team. She’ll be making regular appearances in the future and accompanying Andrew Lennox, the School’s President, on his travels around the world to see students and agents. It just goes to show how little scientists know!